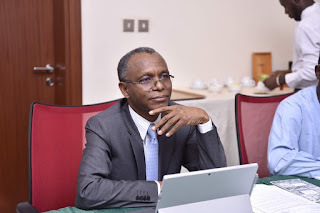 A presidential aspirant of the All Progressives Congress, APC, in the last primaries, SKC Ogbonnia, has asked the Governor of Kaduna State, Mallam Nasir El-Rufai, to resign immediately. El-Rufai was reacting to recent statements by the United Kingdom, United States, and the European Union, which cast doubt on the credibility of the forthcoming 2019 Nigerian elections. In a statement he personally signed and made available to DAILY POST on Thursday morning, Ogbonnia said this open death threat against foreign observers which has provoked worldwide outrage, must be condemned by well-meaning Nigerians, including President Muhammadu Buhari. He said that such barbaric and insensitive statement coming from an elected official was preposterous. According to him, “It is a threat to our nascent democracy, as well as national security, and a dark stain to Nigeria’s image in the comity of nations. “El-Rufai’s death threat to foreign bodies contravenes an objective of the Nigerian Constitution which promotes international co-operation for the consolidation of universal peace and mutual respect among all nations and elimination of discrimination in all its manifestations. “This development must not be treated as business as usual. Governor Nasir el-Rufai has no option than to resign his office honorably. This is a critical time in national history, and we cannot condone public officials fanning the embers of violence. “The Kaduna governor must equally be reminded that Nigeria has intervened in many foreign elections and has also welcomed foreign interventions in the country during past elections. “Very recently, both the ruling and opposition parties did not resent foreign intervention during the 2015 electoral cycle that brought this current government to power. For example, amidst rising fear of civil unrest during the 2015 polls in Nigeria, the United States of America intervened. “It will be recalled that the then US Secretary of State, John F. Kerry, came to Nigeria to dialogue with both President Goodluck Jonathan and his then challenger Muhammadu Buhari to not only encourage free and fair election, but also to discourage violence during and after the election. “Similarly, when the opposition camps were accusing Jonathan of planning to interfere in the electoral process by removing the INEC Chairman, Attahiru Jega, very close to the 2015 elections, British Prime Minister, David Cameroun, intervened. “Nigeria cannot operate in isolation. Foreign interventions for the greater good must not always be viewed as a threat to national independence, as el-Rufai would want people to believe. After all, the current US support in the war against Boko Haram is a form of foreign intervention. Elections should not be exceptions.